Do you want to add value to your clients experience by making their event more memorable and unique? If you are a wedding planner or planning your own wedding you can add some spice to the big day by having your own custom Snapchat Geofilter. Wedding geofilters are super fun and now is the perfect time to use one! It will impress your guests and all of their friends on Snapchat. What is a wedding geofilter? Those of you who are users of Snapchat will surely be in the habit of swiping left or right after you take a snap to check what geofilters are available in your area. These filters are only available in at a specific time and location, which makes them incredibly unique. They are essentially graphics that can be overlaid onto images posted on Snapchat. One of the reasons that they are so popular amongst the 13-30 year old market is that they are a great to show for users to show off their location. It only takes a couple of seconds to choose a filter add it to a snap! Adding geofilters to images is one of the most fun features offered by Snapchat and a huge reason why the platform has grown so quickly in recent years. On-demand geofilters are a new feature on Snapchat. They were made available to businesses and event planners earlier this year and they are becoming increasingly popular. However they are still relatively unheard of and there is a huge for event planners to take advantage of them. The opportunities are endless. For example, event planners could impress their clients with a personal geofilter while including their own logo. This way, when guests share images of themselves having a great time at the event, all their Snapchat friends will see the event planners logo and know who organised it. How can I get a custom geofilter? 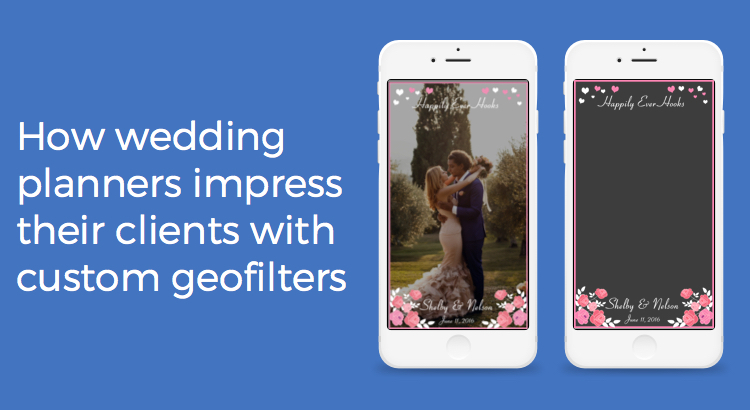 Geo Snapchat Filters saw the incredible opportunity that wedding geofilters present and immediately started designing for wedding planners and small businesses. They provide custom designs and make sure your geofilter is processed by Snapchat for your big day. For wedding clients who want to impress their clients on their big day, get a filter designed here today! If you want to use a custom geofilter but don’t have a wedding coming up check out this post for ways to use geofilters.